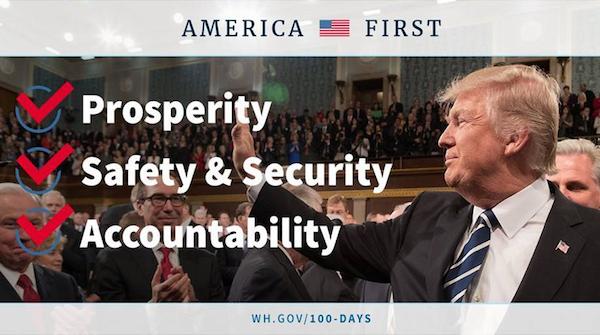 In his first 100 days, President Trump has taken bold action to restore prosperity, keep Americans safe and secure, and hold government accountable. 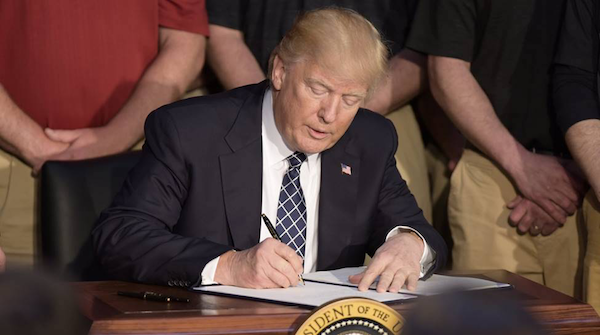 At a historic pace, this President has enacted more legislation and signed more executive orders than any other president in over a half century. With a focus on rebuilding the military, ending illegal immigration, and restoring confidence in our economy, the President is keeping his promises to The American People. The Most Significant Tax Reform Legislation Since 1986President Trump makes tax reform a priority, and we now have a Republican Congress that wants to get it done. President Trump is going to cut taxes for businesses to make them competitive and cut taxes for the American people, especially lower and middle-income families. The President is going to seize this opportunity by leading the most significant tax reform legislation since Y 1986, and one of the biggest tax cuts in American history. Welcome Home, AyaAlthough you did not hear about it in the media, President Trump is looking out for Americans around the globe. An Egyptian American charity worker who was imprisoned in Cairo returned home to the United States after the Trump administration quietly negotiated her release. The President and his team successfully worked with the Egyptian President to free Aya Hijazi after being held for 3 years in Egypt. “We are very happy to have Aya back home,” the President said while meeting her at the White House after her release. American Astronauts Breaking RecordsPresident Trump spoke with 3 brave American astronauts, 2 joined him live from orbit around the International Space Station. One of these incredible Americans, Commander Peggy Whitson, was congratulated by the President for breaking the record of most total time spent in space: 534 days and counting. This is a very exciting time for our country, in terms of jobs, business, and space exploration – and there’s endless excitement and enthusiasm for our future. Watch their meeting by clicking here. 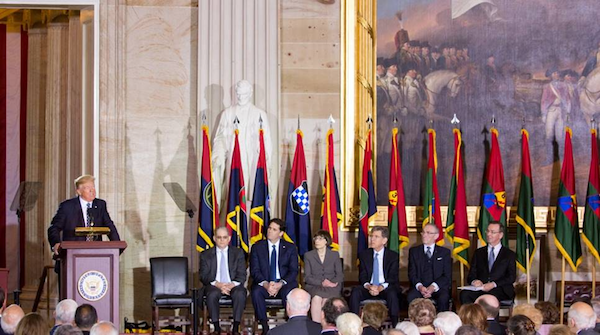 Condemning Hatred And Honoring Lives LostPresident Trump visited the United States Holocaust Memorial Museum to remember the Jewish lives lost during the Holocaust. President Trump vowed that as a nation we will confront anti-Semitism, stamp out prejudice, and condemn hatred. 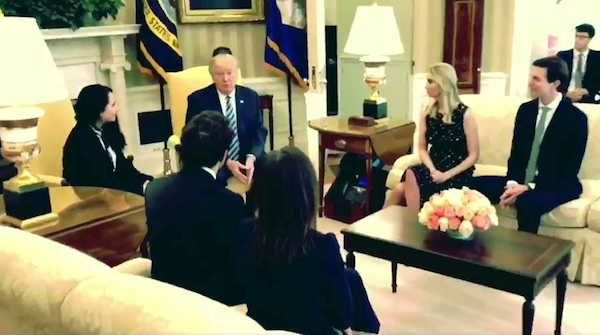 As President of the United States, he will always stand with the Jewish people, and he will always stand with our great friend and ally, the State of Israel. 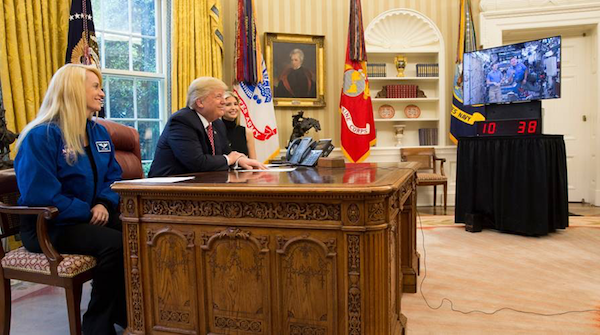 During his 1st 100-Days in the Oval Office, President Trump exhibited a clear vision, resolute leadership, and an uncompromising dedication to the American people just as he promised throughout his campaign. His commitment to the needs of America’s Military Veterans, his work to promote women entrepreneurs, and his championing of American workers have proven him the right leader to put “America First” and get the job done. You can tune in tonight on the major networks to President Trump’s rally in Harrisburg, PA to celebrate his 100th Day in office. And you can go to Team Trump on Facebook and stream it live on you devices.